Fits on any 13.7mm diameter pin. 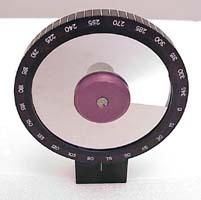 Outer protective meal ring is marked every 5 degrees for positional reference. The filter density varies linearly from zero to approximately 2 over a 330 degree arc.